Medical imaging technologies have come a long way since the discovery of the X-ray in 1895. 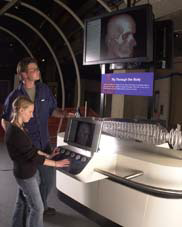 This exhibit offers lessons on some of the many non-invasive ways doctors look into the human body. At the center of the exhibit is "Five Windows on the Body," offering five panels with large-scale images depicting technology such as the PET scan, MRI, and 3-D ultrasound. Find out how each imaging system works, what it's used for, and where the technology is going. Explore the beauty of these medical images in "The Art of Imaging," an art collection of pieces created by doctors and other artists. Here, an X-ray can reveal the inner beauty of a flower, or a CT scan can be the inspiration for a series of paintings. In the "Breast Imaging" area, visitors can explore the group of technologies that doctors use to diagnose lumps or abnormalities in the breast. Hear first-hand from women who have gone through breast imaging procedures, and see how their experiences range beyond the common mammogram. Finally, take some time to see these imaging techniques in action. Be a "Radiologist for a Day" and use real patient images to try your hand at diagnosing three different patients. Or "Fly Through the Body" to see 3-D movies of actual patient CT scans. Younger children (grades K-2) will enjoy "Guess the X-ray," where they can look at X-rays of everyday objects and familiar animals and assemble a skeleton puzzle to see how our bodies are put together.